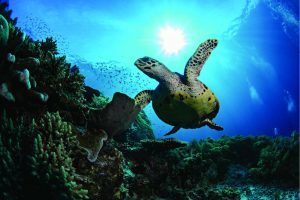 A sea turtle swims among the corals in Tubbataha. Photo credit: Maria Teresa Lara. “Tubbataha: A National Treasure” opens at Glorietta 4 on October 3. The public is invited to view the exhibit, free of charge, until October 31. The exhibit was first mounted at the Oceanographic Museum of Monaco last June, and was fully supported by the Consulate General of the Philippines in Monaco, under Honorary Consul Patricia Zobel de Ayala. A school of jacks at the Delsan Wreck, near the South Atoll in Tubbataha. Photo credit: Maria Teresa Lara. Tubbataha also plays a critical role in ensuring the country’s food security. Studies have shown that fish and coral larvae from Tubbataha are carried by currents and enrich fish populations across the country. 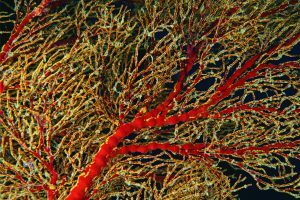 A red coral in Tubbataha. 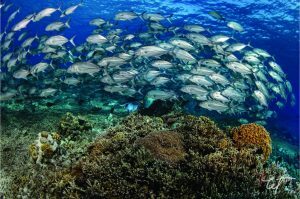 Studies have shown that fish and coral larvae from Tubbataha are carried by currents and enrich fish populations across the country. Photo credit: Maria Teresa Lara.